After kicking off the season at the weekend, I was looking forward to continuing it in midweek. But with a lot of teams still not started, and a number of clubs opting to move their games to other venues to protect their pitches, the choice was not huge. Quite a few options were considered, and eventually, knowing that Anwar would be with me again, decided to go and see Hellenic Leaguers Shrivenham play against local League 1 outfit Swindon Town. The Robins would be sending a youthful side across and with the entry costing just £4, it seemed liked a decent option. Shrivenham were founded in 1900 but didn't join the Hellenic League until 2001 when they were promoted from the North Berks League. 4 seasons later they were celebrating again, as they won the Division 1 West to win promotion to the Hellenic Premier. They finished in a best ever 8th place in that league in the 2005-06 season, repeating the trick in 2008. Lately though they have found life more tricky and last season's finish of 15th was an improvement on the last few campaigns. Their best run in the FA Cup came in 2009 where they beat Calne and Devizes before losing out to Didcot Town in the 1st Qualifying Round. They had their best run in the FA Vase a season earlier, getting all the way to the 4th round before a heavy defeat to Dunston Federation Brewery of the Northern League, Decent players turning out for the side? It's not unusual - former Aberdeen, Reading and Swindon player Tom Jones saw out his playing career at the club in the 2003/04 season. Swindon are a team who Wycombe have faced on a huge number of occasions. Back in the mid 2000's I saw us face each other 4 times in around 2 weeks in Reserves, Youth, League and Football League Trophy contests. In fact The County Ground is my 4th most visited ground with a total of 11 games seen there. I first saw them in July 1993 as Wycombe played a pre season friendly against the then Premier League Robins, this being our debut season in the Football League. We were 1-0 down within 90 seconds, but came back to draw 2-2. Playing for Wycombe that day was Keith Scott, who later that year would join Swindon in a £375,000 deal, ironically signed by future Wycombe manager John Gorman. He would go on to score at Anfield later that season, and although the season ended with the Wiltshire side would go on and concede a boatload that season, they won many hearts with their attractive football and other players such as the Norwegian Jan Aage Fjortoft. I'd have to wait another 5 years for my first visit to the County Ground. That came in 1998 in the League Cup 1st Round, and I had treated my brother to the trip for his birthday. It was an enjoyable evening, despite us losing 2-1 and in any case, the early rounds of the League Cup were over 2 legs back then and we overturned the deficit in the second leg to win 3-2 on aggregate. My favourite memory of our clashes came in 2003 when in Caretaker Manager John Gorman's last match before handing over to Tony Adams, we played the Robins off the pitch as we won 4-1 in an FA Cup 1st Round tie, with all the entertaining hallmarks of Gorman's football. I had the Tuesday off as per usual and so went down town to kill time. I got some Irn Bru to take to the game and also went into Wetherspoons to pick up some leaflets for the upcoming cider festival. I then came home, had lunch and spent the afternoon chilling. I left at 4.30 as I needed to go to the Petrol Station before setting off to pick up Anwar. I arrived at Anwar's about 10 minutes early, thanks to the traffic being especially light. For once, getting out of Aylesbury was OK too, especially considering it was the middle of the rush hour. In fact there were only a couple of trouble spots, both delaying us for 20 minutes. One was on the A41 with an unneeded large piece of road cordoned off for a tiny spot of roadworks. Then there was the usual A420 delay, which seemed to have no cause, especially seeing it was a dual carriageway. We got to Shrivenham about 7 and parked in a nearby road. After paying a cheaper than expected £3 to get in, free programme included, we got some pictures before finding a spot on the halfway line to watch the game. It started at quite a pace, with both teams having spells of dominance, but without any real clear cut chances in the opening stages. 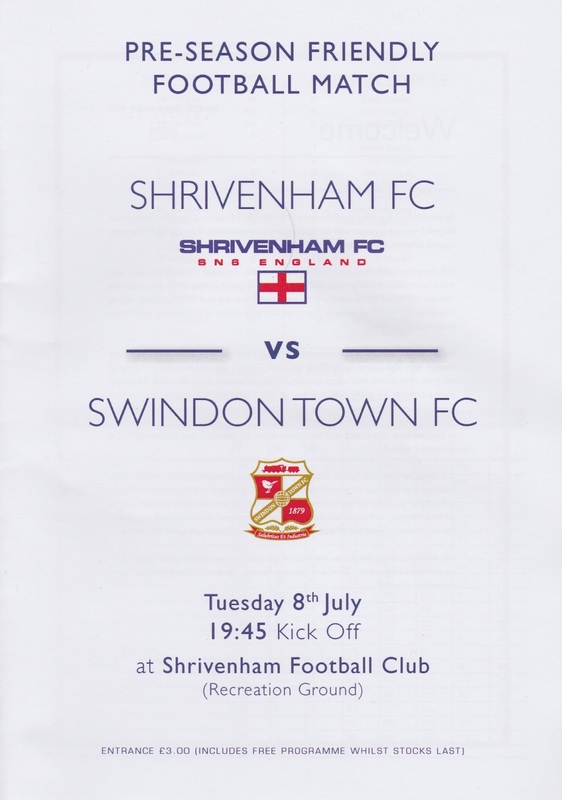 Swindon opened the scoring on 15 minutes with a header after Shrivenham failed to clear their lines. Shrivenham soon equalised however, when their number 10 broke clear of the visitors defence and was left with a simple finish past the keeper. Although there were chances for both sides, it remained level at the break. A couple of minutes into the second half, the visitors were back ahead, the number 10 rounding the keeper before slotting home. It was 3-1 moments later as a decent chip left the keeper stranded. It seemed to be all Swindon from that point on and it was 4-1 on 73 minutes when a player slid in after a low cross was put into the box. Swindon had more chances and a goal ruled off for offside as their full time fitness started to show. Shrivenham did get one back though, on 85 minutes a powerful shot from number 16 flew into the bottom left hand corner, probably the best goal of the night. That was it for goals scored, and by then it was quite nippy for a summers night. We left and made good progress on the way home with only a slow lorry stalling our progress. We also listened to Germany's astonishing 7-1 thrashing of Brazil in the World Cup semi final. I dropped Anwar off at 10.40 before getting home myself around 11. After watching TV for a bit, I got to sleep around midnight, with me up at the usual time of 4am for work. BARRINGTON PARK is a nice enough place to watch football as it is set amongst pleasant greenery. There are just two areas of cover, both seated. There are around 20 seats in front of the clubhouse, this gained it's roof in between my visit for pictures 5 years ago and this visit. Then there is a small metal stand, holding around 40. The rest of the ground is open flat standing. There is not much around the ground that I saw. The clubhouse is modern, but quite small, they have Stowford Press cider amongst other things. And the tea bar does burgers, chips etc as well as drinks and snacks. Everyone at the club was friendly and it's a nice place to visit, especially during the warmer parts of the year.